This post was originally published at the independent student site NYU Local, and is republished here with permission. 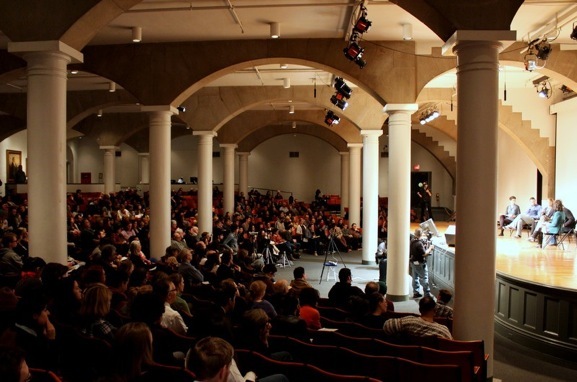 Underneath the cavernous arches of Cooper Union’s Great Hall last night, 550 plush red seats were filled with 550 people, all eyes fixed on a gold-tasseled podium behind which a tall, graying man stood. Between massive white pillars, the audience looked up at a stage once graced by Presidents Lincoln and Roosevelt—a stage whose inauguration speech was given by Mark Twain himself. 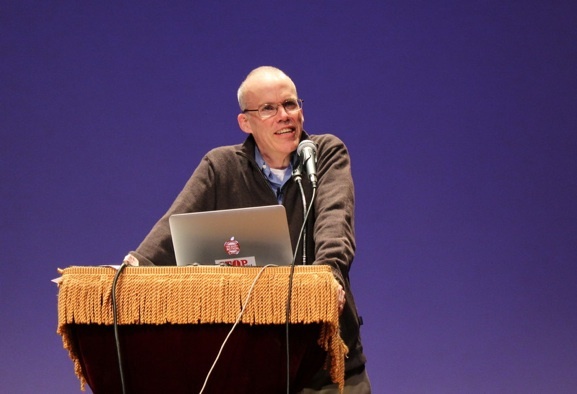 The speaker, environmental activist, author, and journalist Bill McKibben started out the night by describing himself as a “professional bummer-out-er,” because of his dire climate change predictions. But by the end of the night, the crowd was so animated and vivacious, you’d never think they’d been discussing the end of the world as we know it for the past two hours—especially in the aftermath of a weather event that only solidified McKibben’s ominous forecast. 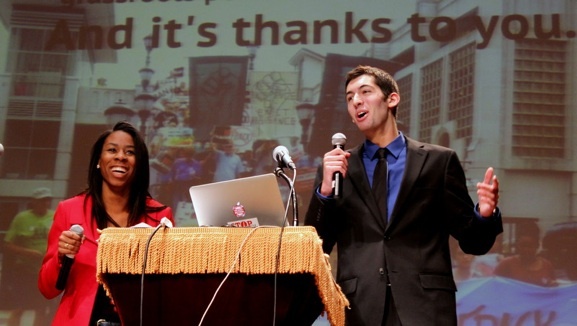 “During Sandy, to watch the water pour in…was to understand the fragility of our civilization in a new way,” he said to an audience of students, activists, and organizations. “The boundaries that we had set up, that we though were permanent—they were not.” McKibben, who has been described by Time as “the world’s best green journalist,” represented his grassroots climate organization 350.org, a movement geared at raising awareness of man-made climate change through international community organizing and activism. 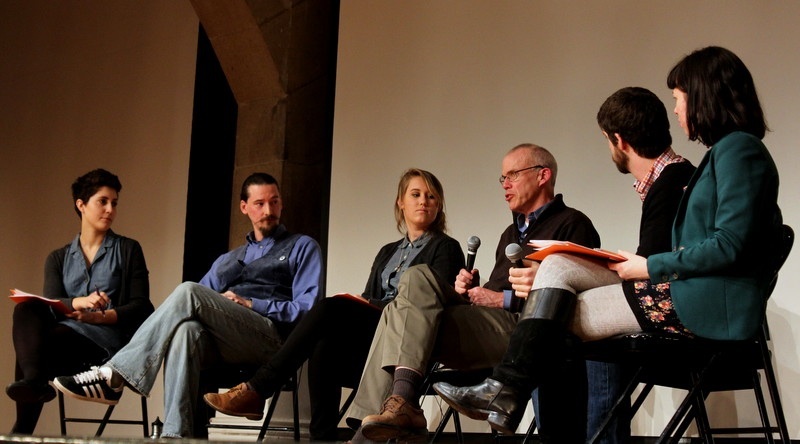 But for NYU and other schools in New York City, the night took on a special meeting—as McKibben discussed the importance of university divestment in fossil fuel company holdings, NYU Divest, a student and faculty-led group, was pinpointed as a growing force in the crusade. The Divest campaign, backed by 350.org, has now spread to 234 campuses across the country, three administrations of which have pledged to divest thus far. The movement urges them ;to demand shareholder divestment from large, environmentally harmful companies. 350.org refers to climate scientists’ call to reduce carbon emissions globally and bring the concentration of carbon dioxide in the atmosphere down to 350 parts per million as a safe upper limit to avoid irreversible effects induced by climate change. Our stance on this proposal is the same as our stance on other politically-driven proposals that relate to the endowment; that it is both unwise and difficult to use the endowment as a vehicle of political expression. Unwise because the principal purpose of the endowment is to serve the University’s teaching and research mission over the long term and so it should be invested to maximize returns for the University, and difficult because in a campus as diverse as ours, there is likely to be a wide range of views on any given issue and it is challenging to determine how to honor any one single point of view. Beckman cited the University Senate as the body that could consider a proposal like divestment and provide guidance to the administration and trustees about it, as “in the past with regard to South Africa and apartheid, for instance.” Ironically, the Divest campaign often alludes to that very movement; divestment by major U.S. universities and other organizations in South Africa’s economy in the 1980’s was one of the driving forces in dismantling that country’s system of racial segregation.